Alli Simpson had a little too much fun on a hoverboard and landed herself in the hospital. Cody Simpson's younger sister tweeted a picture of herself hooked up to several monitors while lying in a hospital bed Wednesday. "Welcome to the hospital Alli...karma .. never liked those dumb hover boards anyway :(" she wrote alongside the scary photo. Alli's mom, Angie Simpson, also shared a Snapchat that her daughter was transported to the emergency room by an ambulance after her accident. Based on the picture, it looks like Alli suffered some serious injuries, but we're relieved to see she still has her sense of humor in tact enough to tweet something funny! It also turns out there was a time when we thought we'd see more of the entire Simpson family on the small screen. E! News confirmed over the summer that Cody and Alli's mom was in talks to join The Real Housewives of Beverly Hills, where she was likely to star opposite Yolanda Hadid, also known as Gigi Hadid's mom. See any connections? Cody and Gigi used to date, so that could make for an interesting dynamic between Yolanda and Angie. The deal, however, didn't work out, so Angie won't be joining the Bravo series. After Gigi and Cody called it quits, Alli told E! News in June that the couple still "cares about each other immensely" and even continue to see each other's families. Since then, Gigi has started dating Joe Jonas and have made for an adorable pair, packing on the PDA wherever they go. 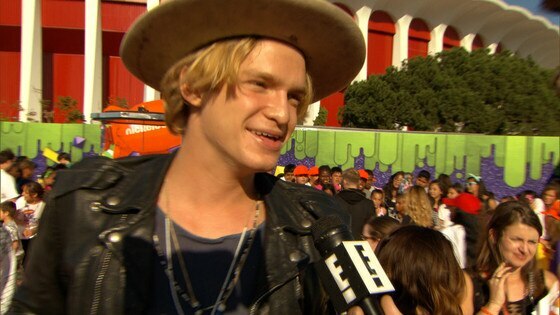 Meanwhile, Simpson has been focused on himself, telling E! News, "I'm 18 years old, and I'm sort of going through that time in my life where I'm like a different person every week."